Aurora Flight Sciences was awarded an $89.4 million contract from the U.S. Defense Advanced Research Projects Agency (Darpa) to build a novel, hybrid electric-powered aircraft under the agency’s vertical takeoff and landing experimental plane (VTOL X-Plane) project. Aurora plans to start flight testing its unmanned “LightningStrike” technology demonstrator in 2018. The Department of Defense announced the second- and third-phase contract award to Aurora, an unmanned aircraft systems manufacturer based in Manassas, Va., on March 3. Three companies competed for the contract, however, Darpa would not identify the losing bidders. In March 2014, the agency awarded first-phase contracts to Aurora, Boeing, Karem Aircraft and Sikorsky Aircraft to develop preliminary designs. 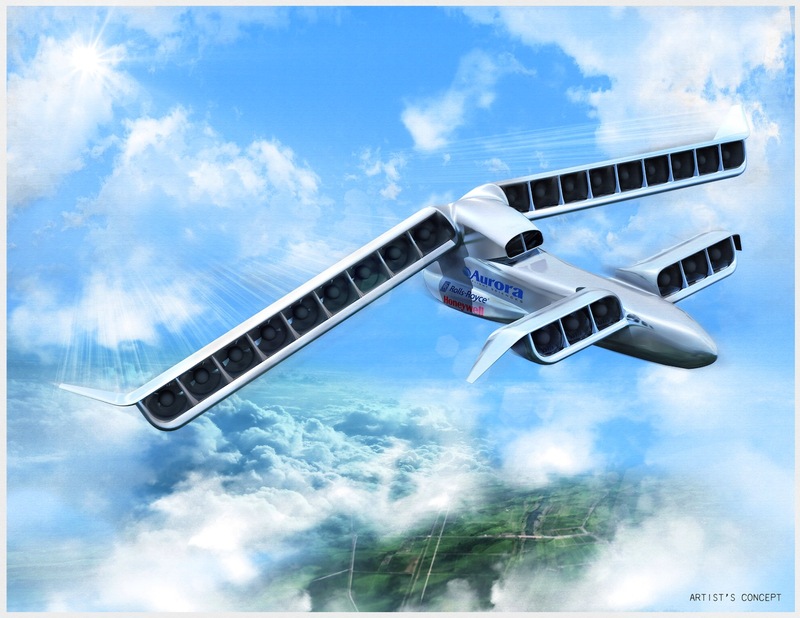 The VTOL X-Plane effort aims to develop and integrate novel aircraft subsystems, making possible radical improvements in vertical and horizontal-cruise flight. The aircraft Darpa specifies would have a top sustained flight speed of 300-to-400 knots, improved hover efficiency from 60 percent to at least 75 percent, improved cruise lift-to-drag ratio, and the ability to carry a useful load of at least 40 percent of the vehicle’s projected gross weight of 10,000 to 12,000 pounds. Aurora’s design features two large rear wings and two smaller front canards. A Rolls-Royce AE 1107C turboshaft engine mounted in the fuselage will power three Honeywell generators and 24 ducted fans distributed on both the wings and canards. The AE 1107C—the same engine used in the V-22 Osprey tiltrotor—will provide 3 megawatts of electrical power, equivalent to a commercial wind turbine, Darpa said. The electric distributed propulsion (EDP) and synchronous electric drive systems will rotate the wings and canards to direct the fan thrust as needed: rearward for forward flight, downward for hovering and at angles for the transition between vertical and horizontal flight. Each wing will have nine ducted fans; each canard three.